In today’s tutorial we are going to cover key input and on the on screen keyboard (OSK). As usual if you just want the associated article source code then you can Download it from here. If you want the details on the updated CInput class then please feel free to read on. Marmalade maps device keys to an enum called s3eKey. if you take a look at the Marmalade SDK header file s3eKeyboard.h you will see that the list of mapped keys is quite extensive. To query the state of a particular key we need to call s3eKeyboardGetState(key), which returns the states of the specified key. Note that its possible that a key can have more than one state. For example, if the user has just pressed the key then it would have both the S3E_KEY_STATE_DOWN and the S3E_KEY_STATE_PRESSED states. This code basically ensures that the modules we are wanting to use are available on the device that we are running on. If we now turn our attention towards Main.cpp, we can take a quick look at what has changed from our previous Touch example. Not a great deal but a little more readable. Happy coding and don’t sit on two legged chairs! Ok, this is the first of my bite-sized tutorials that I have started running alongside my usual meaty tutorials. I see these types of problems cropping on the forums often so I thought that I would cover them in small bite sized tutorials. Another good reason for bite sized tutorials is that I get the chance to blog a little more often as I can put one of these together in 10 minutes. 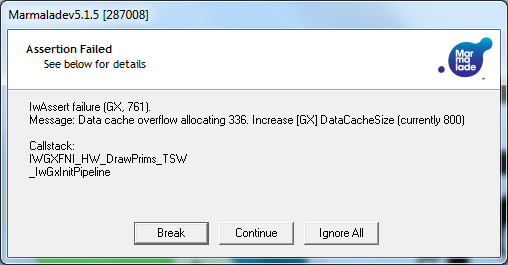 Heap 0 out of memory. Allocating 2048 bytes but only 576 available (540 LFB). Increase icf setting [s3e] MemSize (current value is 14584). This error is basically the Marmalade system telling you that it wants to allocate 2048 bytes but doesn’t have enough memory to allocate it, in fact in this case we only have 567 bytes left. To solve the problem you need to edit a file that Marmalade has generated for you and placed in your data folder called app.icf. This file is the main app configuration file and is where Marmalade stores certain runtime settings such as how much memory to allocate to your program or how big to make the data cache etc.. When running an x86 Debug build the Marmalade system will usually require additional memory to build resources and such. Marmalade provides an additional S3E app.icf option that allows you to specify memory size during debug builds. Keep an eye out for more bite sized tutorials coming very soon! A little rushed this weekend but I did kind of commit myself to producing another tutorial this weekend, so here goes. This tutorial is going to cover handling touch and multi-touch pointer events using the Marmalade SDK. 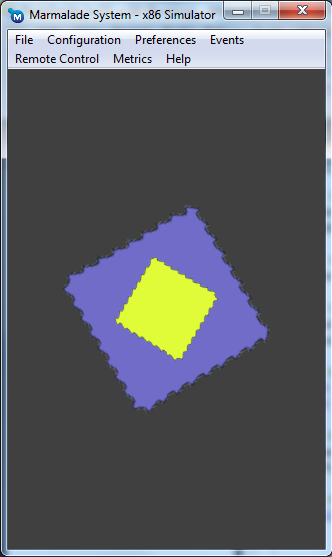 Thankfully the Marmalade SDK makes this pretty simple as you will soon see. In this example HandleSingleTouchButtonCB gets called by the system when the user touches the screen. Behold, the system has also provided us with some data about the event by way of a pointer to the s3ePointerEvent data type. We can now query this data to find out what the system wants to tell us. Eik! I know, looks a bit messy, but callbacks usually do look a bit out of place. That said I do love callbacks! Like any good programmer we are checking to ensure that the pointer system is available on the device that we are running on, with so many different handsets out there, who knows if there are some with no pointer support? Its better to know up front and inform the user that your game or app is not compatible with their phone because it does not support the pointer. Next, we determine if the device supports multi-touch. Note that many Android phones and tablets do not support multi-touch, so you will have to think carefully about your game or apps design before targeting Android. If we now turn our attention towards Main.cpp, we can take a quick look at what has changed from DrawSprite_Iw2D. Well the first thing is the inclusion of the CInput.h header file. Ok, this bit of code is no longer a bit of code and looks a bit meaty. However, it is very simple to understand. Firstly we check to see if there has been any touches by getting the touch count from CInput. If there are touches present then we get the first touch and set both sprites to the position of the touch. This will move both sprites to wherever the user taps the screen. The second part checks to see if there has been more than one touch, if so then we get the 2nd touch and move the 2nd sprite to its position. Note that I am just getting the touches by their index in the touches list and not by their ID. In a proper multi-touch system you should ideally track touches by their ID and not their index in the touches list. But for this example, this way suffices. Now that you have enabled multi-touch simulation you can use the middle mouse button to place touches. You can move the touches around by holding the middle mouse button down over the placed touch and move it. To remove a multi-touch touch, simply click the middle mouse button over the touch again. Happy coding and stay away from rickety old bridges!